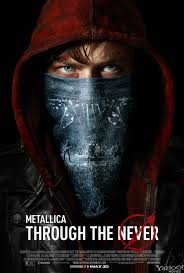 Metallica: Through The Never opens in cinemas across Australia on 10 October 2013 and is distributed by Hopscotch Films. Now showing in cinemas across the USA and the UK. Metallica: Through The Never is described by the official movie website as being "a groundbreaking music-driven 3-D motion picture event". In some ways it certainly is, but perhaps not in all the ways that the film makers and Metallica hoped it would be. First and foremost, Metallica fans will be absolutely thrilled with this film. Unlike 2004's Metallica: Some Kind of Monster which was a documentary, Through The Never is a 3-D concert film which is best experienced on the big screen. It gives you the feeling as though you really are there amongst the Metallica fans for this one off concert which took place especially for the film. However, in amongst the set is also a subplot centring around a roadie, Trip (Dane Dehann) who has been sent on an urgent errand for the band during their show. 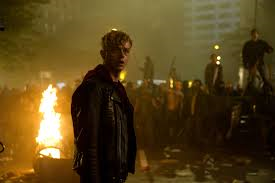 He enters into the city and finds he is in the centre of a violent uprising in which he has to fight for his life as well as making sure his beloved band receive the mysterious bag he has been sent out to retrieve. Again, this is the ultimate for Metallica and general rock music fans. It allows you to be right up there in the front row of this incredible concert event. An arena spectacular which has one of the most elaborate sets you will ever see makes this concert an absolute must see. 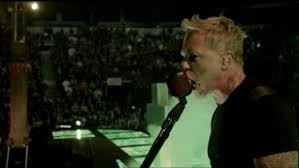 Metallica perform their greatest hits including "Enter Sandman", "Nothing Else Matters", "One", "Fuel" and "Master of Puppets" and do so flawlessly while around them the stage morphs itself into a living, breathing video clip, and that is in no way a bad thing. Coffin shaped screens lower showing clips of people who are not dead and trying to be set free are definitely a memorable moment, but perhaps the most memorable is the completion of a large statue which moves and then falls apart on stage leaving no doubt how heavy duty it really is. However, the flip side of the film which is Trip's journey leaves a great amount to be desired. Although it is assumed that if you are going to see this film you are going as you are a Metallica fan and you are more interested in the concert aspect, the "narrative" of the story is just not all it could be. It starts off interesting enough with Trip entering the arena and seeing the band through his eyes backstage. There is also suspense and tension when he enters into the deserted city and is bit by bit faced with the horror that has taken place. And then you are left to figure it all out by yourself. This isn't always a bad thing, but search hard for the clues as to what is actually going on and you still can't find any which makes it impossible for you to draw any real conclusion about what you are seeing. If there was a real story behind the mash up of images, one would not be bothered so much. There does start off being some continuation, but this is lost just as you think you are about to figure out what is going on. Dane Dehann does well for what he is given. He does spend the large majority of his on screen time looking confused more than anything else, which will probably match what most of the audience are feeling too. The bottom line with Metallica: Through The Never is that on the big screen it will be one of the year's highlights for Metallica fans. It would have benefitted so much more from being just a film about an outstanding concert event, rather than trying to fit in a story which doesn't seem to go anywhere or make sense. By trying to add this "story" into the film and trying to make it a film for more people than just Metallica fans, it actually does the opposite.